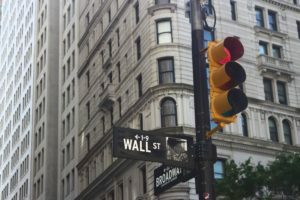 Given my interest in investing and hopefully launching a startup in the near future I have always been intrigued with trying to define the secret formula for success and the factors that actually matter the most for the success of a startup. Given my finance and quantitative background, I have tried to figure out if a magic formula actually exists that would drastically reduce the very high failure rates of startups. 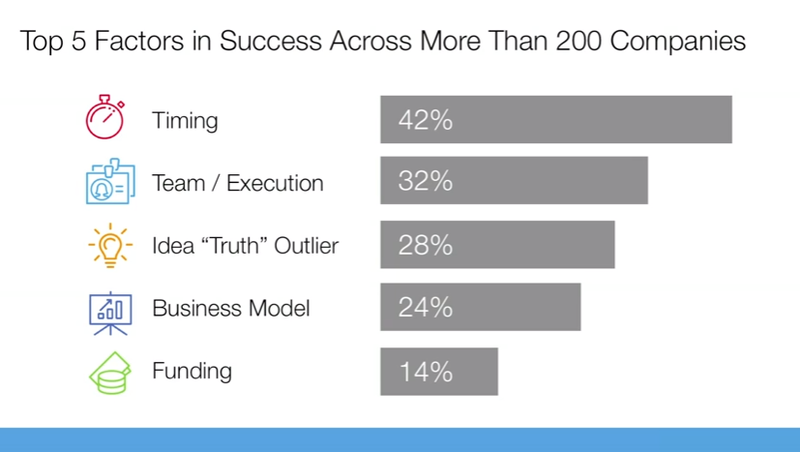 A few days ago a friend sent me Bill Gross’ TED talk, “The single biggest reason why startups succeed” (https://www.ted.com/talks/bill_gross_the_single_biggest_reason_why_startups_succeed), which provides an interesting answer. 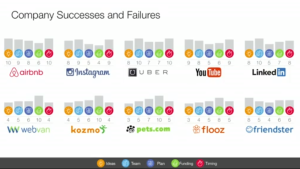 After defining the key elements he analyzed 100 portfolio companies that he had launched from Idealab and 100 other startups and ranked them across these 5 elements. 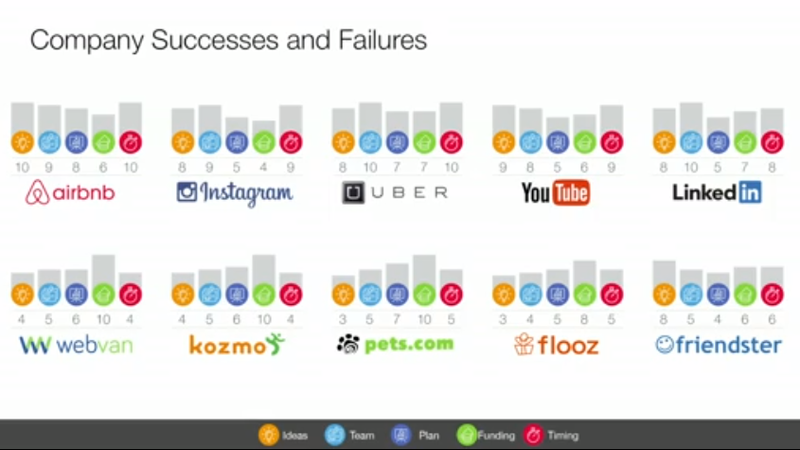 Below is a sample of the non-Idealab startups including successful companies on the top row and failures in the bottom row. It’s important to clarify that these findings don’t claim that the other elements are not important or necessary. Instead, it just means that timing plays the biggest role in the success of the startup. After today’s class (9/22) I linked Bill’s conclusion directly with one of the key takeaways our guest (serial VC investor) mentioned in class. He stated that Founders really need to make sure that once they define a problem and find a solution, it is imperative to confirm that the end consumer actually sees this issue as an actual problem. In a sense, the element of timing will be essential in the path towards achieving product-market fit. 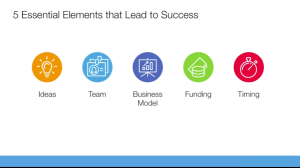 You can follow the lean startup methodology and be surrounded by the best investors, advisors and employees. However, if the timing is not right, your chances of success will be significantly affected. The main issue that I see with these results is that out of these 5 elements, timing is the one where you have the least amount of control or influence over it. You can argue that there are strategies that you can follow in order to have some sort of influence over the other elements. However, what you can definitely do as an entrepreneur is focus even at the initial stage in trying to figure out if it’s actually the right timing for your idea before you end up spending time, capital and other resources. Previous Submission	What is FAIR? Isn’t it frustrating that the most important driver of success is one that is out of your hands? I really liked the Airbnb and Uber examples – they both found ways to turn the tough times into their favor. But it wasn’t just the recession that drove their growth. Increased use of mobile devices was huge; they were able to tap into a vast network of individuals all across the world very quickly with their innovations. When I think about a company that has a somewhat decent idea but in the wrong time, I think about Kozmo. Kozmo was a VC-backed company that offered one-hour delivery of food, books, music, etc. Think about it… it’s basically like Uber Foods or Favor or Instacart. The problem? It was a decade ahead of its time. The lack of mobile devices with tracking integration, made consumers less excited about the product, whereas now, companies with almost the exact same idea (though perhaps less diversified) are booming. As an entrepreneur with “revolutionary” ideas, making sure that consumers are ready and that the technology is sufficient for optimally using your product is absolutely important. It’ll take a lot of surveying and product testing to gain consumer feedback, but it’s also important to remember that (at least in my opinion) the best products or services are the ones customers didn’t even know they wanted. People may say the timing is wrong, but maybe it’s actually just right, so don’t dismiss your idea too easily.